We open in early October when the fresh chestnuts start falling. The crop is sold out by mid-November. "Like" our Facebook page to receive advance notice of opening day for 2019. 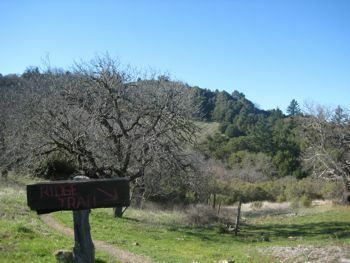 Skyline Chestnuts is a 20-acre orchard sitting at an elevation of about 2,500 feet above Palo Alto in the Santa Cruz Mountains. It is a perfect natural location for growing the non-native chestnut trees with sloping terrain to provide ample air circulation for wind pollination, a generous supply of natural underground water and a microclimate that provides significant annual rainfall in the winter and coastal fog in the summer and fall. The trees are a mixture of European, Chinese and American genetics to the best of our understanding. The Skyline Chestnut Orchard was originally planted over 100, and perhaps as long as 150 years ago. Shortly after California was acquired by the United States in 1847, a Spanish settler (whose name we do not know) moved up into the mountains where he planted the oldest of the trees growing here today. The property was purchased by another family sometime in the first part of the 20th century. 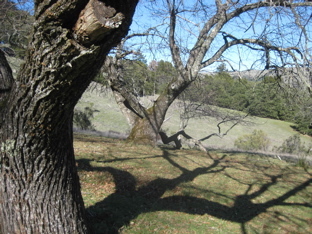 This family sold the land to the Midpeninsula Regional Open Space District in the early 1980s and continued to operate the orchard for nearly 20 years until they became unable to continue doing so. After several difficult years of going without management which developed into a state of near anarchy, the orchard came under the Johsens' management. Since 2004, the Johsens have worked very hard to restore the long-neglected historic site to its current state of majesty and reclaim a sense of order so that everyone could enjoy these delicious chestnuts (one customer lovingly refers to them as “beautiful brown diamonds”) as they ripen every Autumn. 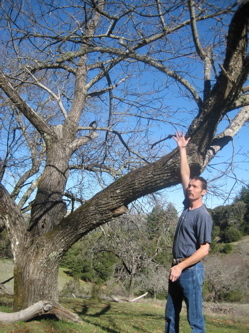 When it became clear that the Midpeninsula Regional Open Space District could not continue to let the orchard go unmanaged, they asked the Johsens family to take over the seasonal operation of it under a special license agreement. The Johsens had already been managing a cut-your-own Christmas tree farm on land leased from the District (www.skylinetreefarm.com), and several other Christmas tree farms on other lands (www.timberlinetreefarm.com and www.lonestartreefarm.com). The Johsens’ quickly realized that the property and heritage trees needed much more work than could be done in one season, let alone only one part of the year, in order to get it up and running properly again. The idea was to have the farm available to everyone on equal terms and they have been working hard to fulfill that goal. The family has been farming in the Santa Cruz Mountains for three generations now, starting in the early 1940s with a cut-your-own Christmas tree farm (a concept that the family developed over 50 years ago). In addition to Skyline Chestnuts and Christmas trees, the Johsens Family also keep honeybees and sell the honey (available at the Orchard).